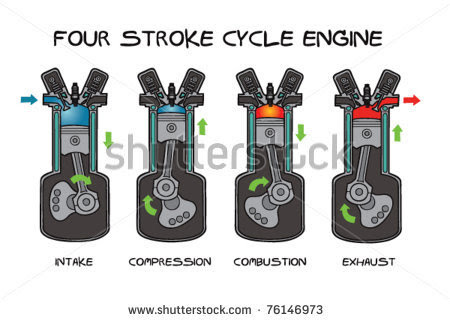 In this post you will see that how a four stroke engine works.first I will tell you about how it works.the four stroke engine was first demonstrated by nikolaus otto in 876 hence it is known as the otto cycle. Actual name of engine is four stroke cycle.nowadays this engine used in cars and trucks.so it is the most common engine. 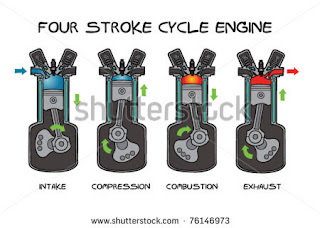 Major steps involved in four stroke engine are: intake,compression ,power and exhaust.each corresponds to one full stroke of the piston;so the complete cycle requires two revolutions of the crank shaft to complete. During this step piston intake a mixture of vapourised fuel/air.the mixture goes inside due to vacuum produce inside of it. Old engines worked in this way.now with the passage of time engine developed too and now they incorporate an extra cam/lifter arrangement as seen on the exhaust valve. 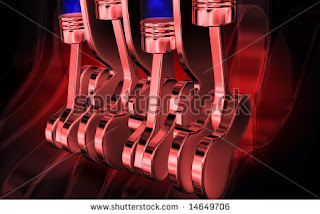 Spring technique is used to shut down exhaust valve. Second step is compression, as the piston rises fuel gets compressed due to FLYWHEEL arrangement. Poppet valve is forced shut by increased in cylinder pressure. After compression stroke the spark plug fires which ignite the compressed fuel. As the fuel burns it expands,driving the piston.